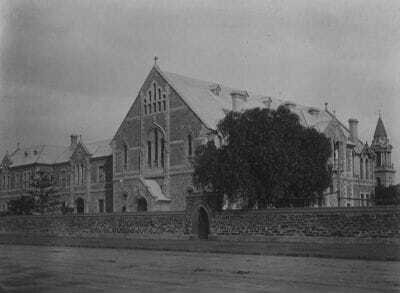 The oldest continuously running school for girls in South Australia, the College was established on February 2 1869, following the arrival in Adelaide from Dublin, Ireland, of seven Dominican Sisters. They came in answer to the call of the Bishop of Adelaide, Rt Rev. L. B. Sheil, who wanted 'a select school for girls whose parents could afford to pay for education beyond the elementary stage'. They took up residence in three small cottages on the corner of West Terrace and Franklin Street. In December 1868 the foundation stone for a building known as St Catherines was laid. This early building is remembered in facilities built in 1996 which carry the same name. In 1871, the Dominicans were invited to move into the building now known as the Convent, and, in 1898, substantially extended it to include the Boylan Building, which remembers Sr Columba Boylan, an early Prioress. Since that time, the Moore Building (1966), named after Mother Teresa Moore, the founding Prioress, and the Kavanagh Building(1987), named after Sr Catherine Kavanagh, have been added to student facilities. In 1991, part of the Boylan Building was refurbished and in 1994 for Music, Drama and Information and Communication Technology were opened. 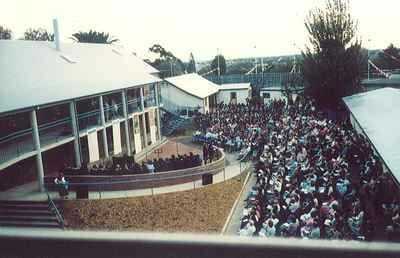 From the beginning of 1995, the College has had access to the Convent buildings, including the historic Chapel where Mary MacKillop was excommunicated. New classrooms for Junior School students, as well as new facilities for Information and Communication Technologies, Science and Food and Nutrition, called St Catherine's, were opened in 1996. A gymnasium, Veritas Hall, was also opened at the same time. By the commencement of the 2001 school year, further Information and Communication Technology facilities became available to students, in addition to a new Tuckshop and outdoor eating areas. A stained window designed by a student, Sarah Woite, in 1995, and found in the stairwell of the Boylan Building, symbolises the history of the College. Green three leafed clovers reflect its Irish heritage, while part of the Dominican crest signifies the Dominican ethos so important to the community. The plane tree leaves are part of the Australian landscape just outside the window, while the stairs indicate the opportunities given to students of the College. In 2006 the St Mary's College Centre for the Performing Arts was completed providing a theatre, instrumental tuition rooms and a suite of Drama and Music classrooms. This development highlights the success of the Performing Arts Program at St Mary's College. In 2010, the College commenced two separate building projects in alignment with the Federal Government funded Building Education Revolution Project. The first being the refurbishment of the upper floor of St Catherine's Building where the woodwork and textiles rooms were completely redesigned into a modern Design Suite accommodating the new approach to Design in the Middle School. The second, and bigger project, is the building of a new Library/Resource Centre, Out of School Hours Care facility and three Junior School classrooms. The three new rooms are to accommodate the Junior School which moved to a single stream class structure - Reception, Year 1, Year 2, Year 3, Year 4, and Year 5 in 2010. This larger project was completed early 2011 with the Opening Ceremony being held on 5 May 2011.